Built around the need for an affordable, yet fully featured shoulder mount 3MOS 1/3-inch camera recorder, Panasonic proudly introduces the AJ-PX380, the newest member of the AVC-Ultra P2 camcorder family. 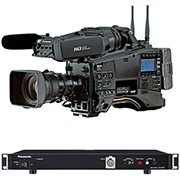 Designed for Modern News Production, Education, Industrial and House of Worship, the PX380 offers a hosts of production features, including powerful IT / wireless connectivity. The PX380 is ideal for those needing the ergonomics and reach of a shoulder mount camera, yet don’t have budget for the larger 2/3-inch native cameras and lenses.